Chennai is called the gateway of South India. This city is previously known as Madras. It is situated on the Coromandel Coast of the Bay of Bengal. Chennai is the capital city of Tamil Nadu state. It is a hub of an educational institution. There are many famous universities/colleges which provide higher quality education in the field of engineering & technology. The average literacy rate of this city is 90.18%, according to the 2011 census. Check this article to get detailed information about Top Engineering Colleges in Chennai 2019. Here, we are providing the list of top engineering colleges, admission procedure, specializations, etc. For academic session 2019-20, we have listed the top engineering colleges in Chennai. We have included all the private, government, public institutions such as India Institute of Technology (IIT), etc. These colleges offer four-year Bachelor of Technology (B.Tech) course. After a deep survey & study, our experts give the rating to these institutions on the basis of several factors. The rating is given by advanced technology education, college infrastructure & facilities, placement statistics, national importance, faculty competence, student’s preferences, etc. For admission to the B.Tech programme, students must qualify the national level examination (JEE Main). The admission to the B.Tech & B.Arch courses in Chennai city will be based on JEE Main score. The Anna University will organize a TNEA (Tamil Nadu Engineering Admissions) procedure to get admission into engineering courses. There are some universities which regulate a university level exam for admission to the engineering programme such as SRMJEEE, VITEEE. Students will have to appear GATE examination to get admission into the M.Tech programme. There are many disciplines/specializations of engineering courses which are offered by various universities & colleges in Chennai. Some of the most popular specializations are Automobile Engineering, Information Technology, Mechanical Engineering, Aeronautical Engineering, Computer Science & Engineering, Electronics & Communication Engineering, Civil Engineering, etc. 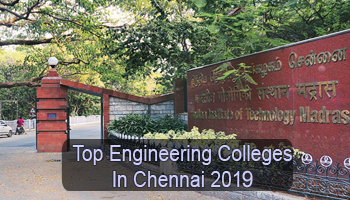 If you have any other doubts about Top Engineering Colleges in Chennai 2019, you can leave your query in the comment box below. What is the rank of VIT -Chennai campus (Vellore Inst. Tch.)? What about Meenakshi Sunadarajan Engineering College . can I have the rating for the same. I am Kalaivani, my daughter is now in 12th standard writing state board examination. I think she can get 175-180 cutt off this year. can she get engineering admission in top 10 colleges. what about sathyabama university? ?have u been to that campus. I would like to know the list of best colleges for B.Sc microbiology in Chennai. Please suggest.